Following on from an incident-packed Monaco weekend, we are likely to see more of the same in Montreal, as the Canadian Grand Prix often finds drivers pushing the limits until they crash through them. The appearance of a Safety Car around the Circuit Gilles Villeneuve is not an unusual one, but hopefully we'll get some excellent racing as well. Mercedes had a good outing in Monaco, finally managing to turn their pace in qualifying into a race victory, after finding some tyre management skills around the principality. There's a rumbling issue with a tyre test hanging over their heads, but all they can do at the moment is keep trying to focus on each race as it comes. Meanwhile, Red Bull want to keep their lead on both champions, as Fernando Alonso fights to stay in contention. Support racing for this event includes Ferrari Challenge, Canadian Touring Car Championship, Porsche IMSA GT3 and Formula 1600. The weather in Canada can be as changeable as Europe, and it looks like there will be showers in the area for the full race weekend. The forecasts show it gradually getting warmer and drier as Sunday draws near, but this is all open to change at the drop of a hat. Last year, we had just one DRS zone around the Circuit Gilles Villeneuve, and this year it's been expanded to two - or perhaps one and a half. We have the one detection zone that comes before the hairpin and then two detection zones - one down the straight following the hairpin, and another coming directly after the Wall of Champions. On paper, this looks like the idea setup for DRS - the first zone may not make too much difference but should close the gap for cars coming off the hairpin. The second will then allow for the overtaking opportunity down the home straight, and we won't get the occasional Double DRS issue of a car being overtaken straight back again. That's the theory, anyways. One of the most important characteristics of the circuit is the Wall of Champions, turn 13. A sharp right/left kink in the long straight to the finish line has seen more drivers than can be mentioned head straight into the wall. It’s a particularly challenging section of the track, coming at the end of a long and difficult lap, and it takes concentration each and every time to stay out of the wall and keep heading straight towards the start/finish line. It only takes a moment to bash the side of the car hard into the wall, throwing away opportunities for points and podiums. 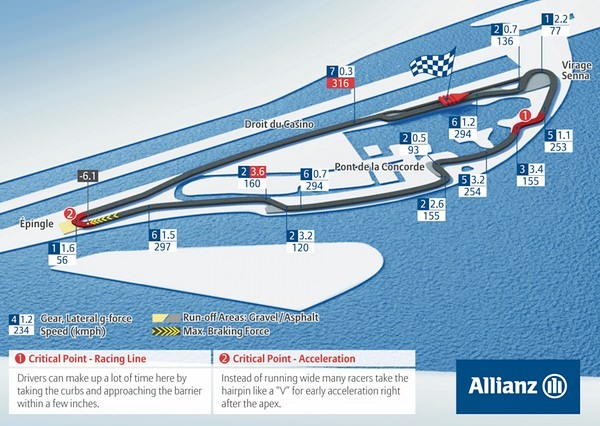 Unlike the races leading up to this event, the Circuit Gilles Villeneuve provides a new challenge for the teams. There are plenty of long straights which require high speed but each comfortable straight ends in a tight corner, which makes it extremely heavy on the brakes. These type of corners can be difficult to set a car up for, but they also provide some excellent overtaking opportunities for the fans to enjoy. The tyres are still garnering a lot of attention, for racing and testing and everything in between. 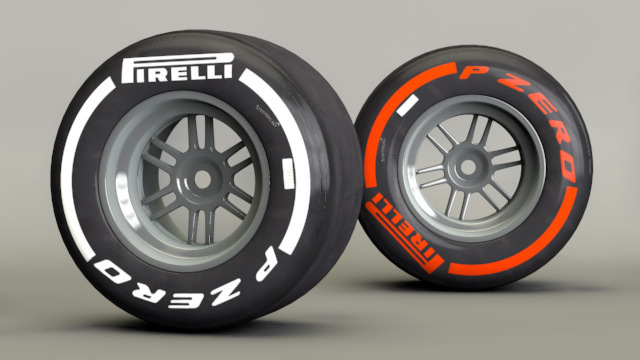 In Canada, there are some special compounds to be used in practice, but it is the existing medium (white) and supersoft (red) tyres that will feature when the action begins proper. Motorsport director, Paul Hembery, believes there will be a mixture of options as to how to get the best race. Because of the high degree of tyre wear and degradation, we would expect to see a number of different strategies at work, as was the case last year – with teams deciding whether to go for a ‘sprint’ strategy or to do fewer stops and put the accent on endurance. Martin Donnelly Formula One driver 1989-1990, demonstrates in the Lotus 102 at various events, owner of Donnelly Track Academy.